In that piece, I wrote about how I didn’t feel like I was losing interest in the blog, but deep down I low-key was. It wasn’t really exciting at that point. I was generating 10,000 views a month and felt like I wasn’t really breaking any new ground. I grew really tired of doing the same thing over and over again, but I kept going. Then in December when I hit 70,000 views I felt like 2015 was going to be a terrible year. And for 1 month, I was right. In January, I generated 8,000 views. I thought I was never going to generate 100,000 views, but everything changed in February. I generated 35,000 views and in March I generated 34,000 views and just like that I hit 100,000 views. At this point in time I finally got accepted into the WordAds Program, so I can finally get paid. Essentially there’s two ways of getting paid when you’re a blogger on WordPress. You can self-host and put ads on the website yourself or you can get into the WordAds Program and WordPress handles everything. I wanted to be in WordAds more than doing everything myself, so I had to wait until I hit roughly 100,000 views to get into the program. It was honestly worth the wait. But after hitting 100,000 views and finally being paid, I felt like I managed to accomplish everything I set out to do when I started, but I kept going. I really kept going because my traffic was incredible. Since February of 2015, I’ve generated 723,643 views. With these numbers, there was no reason to quit. I really didn’t see this going past 2014 though. I can’t believe it’s 2016 and I’m still doing this. I can’t believe it’s been 2 years. 2 Years! I don’t know what this new year has in store, but I’m hoping it’s going to be great. It’s weird too because I’m graduating college this year and after I graduate and hopefully land a job in the media industry, I don’t know what will happen to this blog. I’ve covered NXNE because of this blog, I’ve covered Canadian Music Week because of this blog, so I’m well prepared to be in the industry. As always, thank you for continuing to click my site. It’s me and whoever you are. 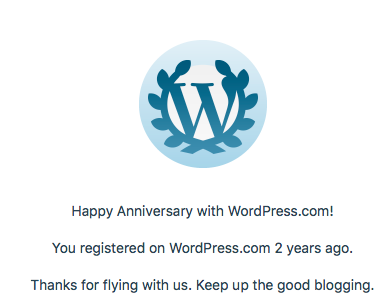 Let’s hope this blog is generating over 1 million views when I write my 3 year anniversary piece!